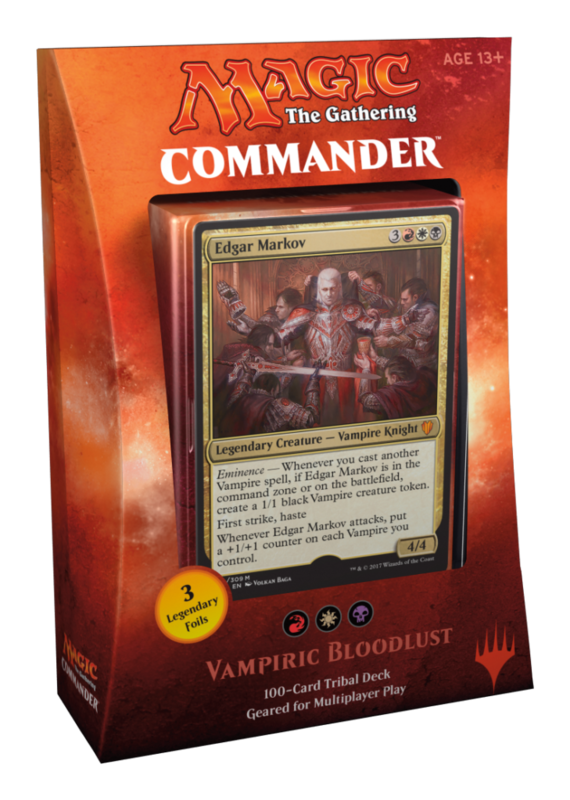 Day 3 – Commander (2017 Edition) spoiler week continues, and this time, we’re dealing with Vampires. 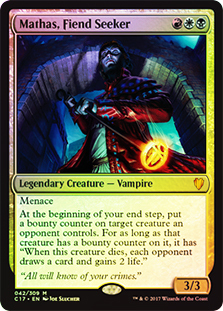 The Vampiric Bloodlust deck stars Edgar Markov, Innistrad’s first Vampire, and founder of the Markov line. 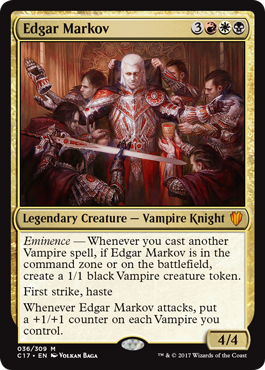 Overall, the cards we’ve seen so far seem powerful, including Edgar Markov‘s Eminence ability, which gives you a 1/1 black Vampire creature token every time cast a Vampire spell – even when he’s in the command zone. Check out previously spoiled C17 cards, including Cats (Day 1) and Dragons (Day 2). 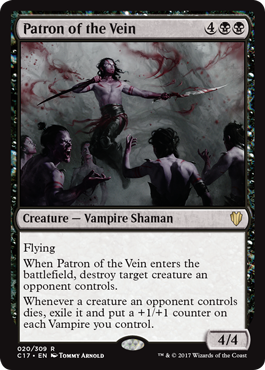 We also got our first look at a new cycle of curses, spread across this year’s Commander decks. Each curse gives the caster a benefit whenever the cursed player is attacked. To encourage others to attack the cursed player, the attacker receives that benefit as well. 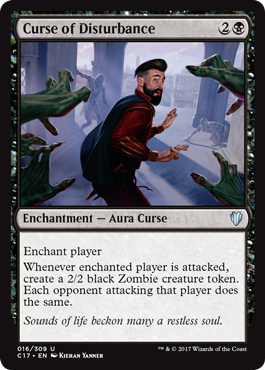 Perhaps the most appealing curses are Curse of Verbosity, which allows you and the attacker to to draw a card; and my favorite, Curse of Bounty, which untaps all nonland permanents you and the attacker control. Commander is a format full of mana rocks and expensive spells, so getting the opportunity to untap your nonland mana sources and cast more expensive spells will certainly prove tempting. Even better is that Curse of Bounty only costs 1G. Also note that the curses are threats that put a target on other players, not you. The most interesting card, hands down, was neither curse nor Vampire. Rather, it’s Teferi’s Protection. 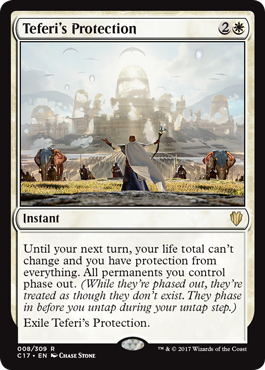 For 2W, this instant locks your life total in place, gives you protection from everything, and phases out all permanents you control. That is right, phasing is back! Phasing is an ability that essentially causes one or more permanent (and all cards attached to them) to appear nonexistent to the rest of the game, without leaving the zone they are in. The last time we saw phasing was on the Unhinged card Old Fogey, which was itself a joke about abilities only older players would remember. Prior to Old Fogey, phasing was an ability that only appeared in Mirage block (which consisted of Mirage, Weatherlight and Visions). 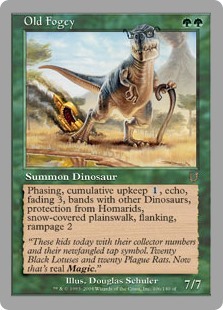 The Mirage block has historical significance as the first intentionally designed block in Magic: the Gathering. The three sets took place in Jamuraa, a supercontinent on Dominaria. The Mirage Wars served as a turning point in how Wizards of the Coast developed their lore, and lead into the Weatherlight Saga, Magic’s main storyline for a number of years. 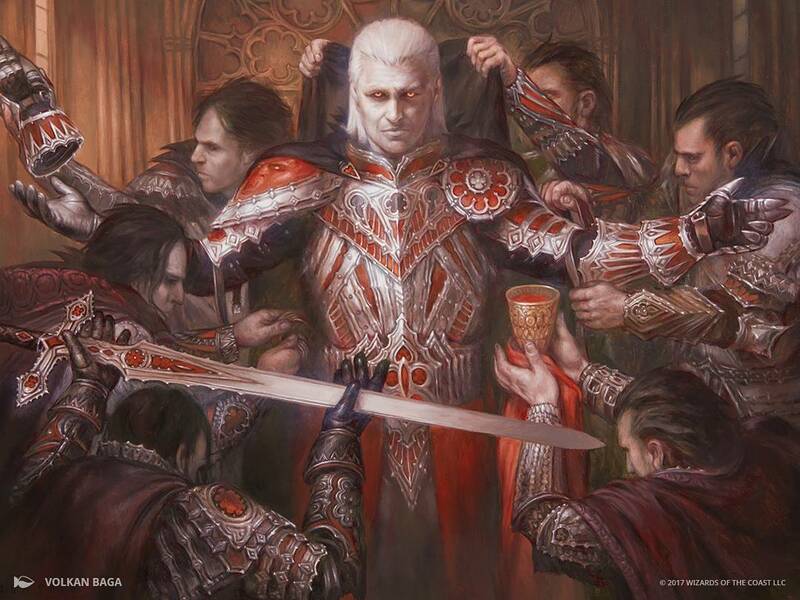 While it is certainly possible that Wizards is using C17 as a chance to play around with cards that do not fit well in other sets, the fact that they are making rules changes at the same time could indicate plans to print more cards with phasing. And I think that’s a good idea. Phasing has always offered the unique ability to temporarily remove a permanent from the action without all of the negatives that come with exile. Since phasing was always meant to do that, it does make sense to finally include tokens. In a way, phasing has always been about disappearing, but only for a moment. Let’s take a look at all of the cards spoiled today. 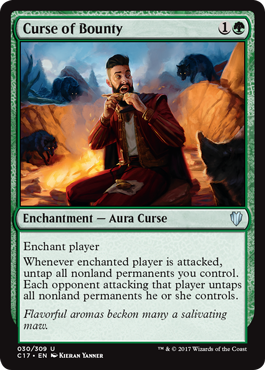 Flavor text: Flavorful aromas beckon many a salivating maw. Flavor text: Sounds of life becon many a restless soul. Whenever enchanted player is attacked, create a colorless artifact token named Gold. 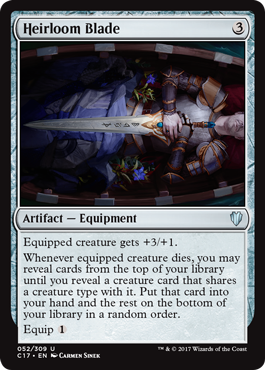 It has “Sacrifice this artifact: Add one mana of any color to your mana pool.” Each opponent attacking that player does the same. 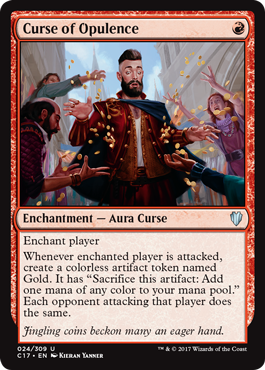 Flavor text: Jingling coins becon many an eager hand. Whenever enchanted player is attacked, draw a card. Each opponent attacking that player does the same. 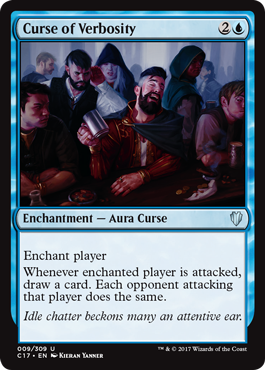 Flavor text: Idle chatter beckons many an attentive ear. 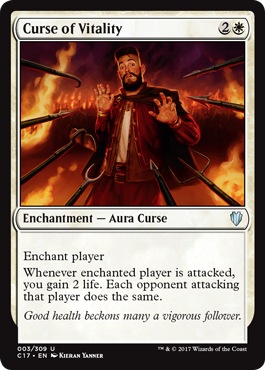 Flavor text: Good health beckons many a vigorous follower. 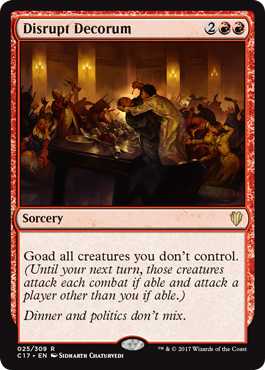 Flavor text: Dinner and politics don’t mix. 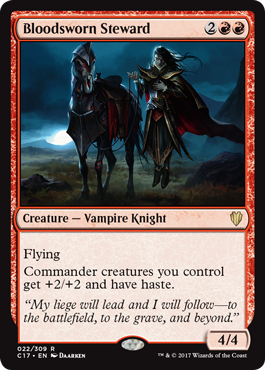 Eminence – Whenever you cast another Vampire spell, if ~ is in the command zone or on the battlefield, create a 1/1 black Vampire creature token. 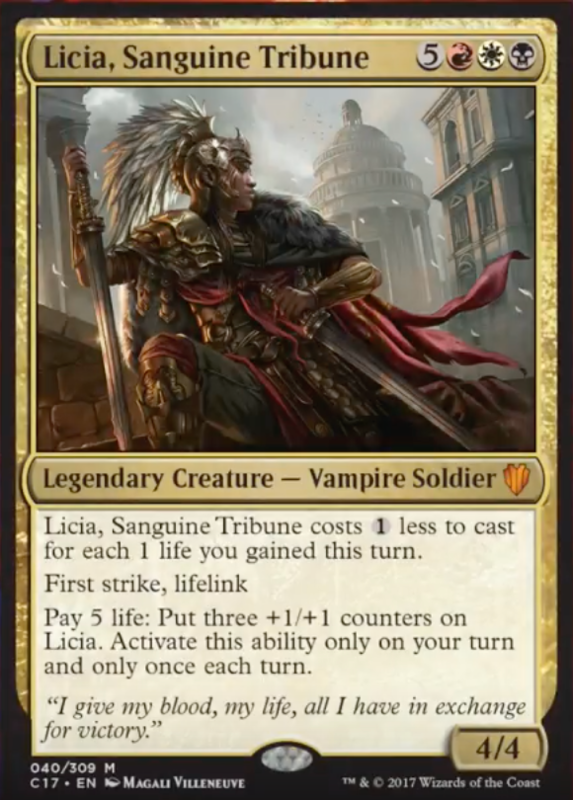 Whenever ~ attacks, put a +1/+1 counter on each Vampire you control. Choose a creature type. For each creature you control of the chosen type, create a token that’s a copy of that creature. Those tokens gain haste. Exile them at the beginning of the next end step. 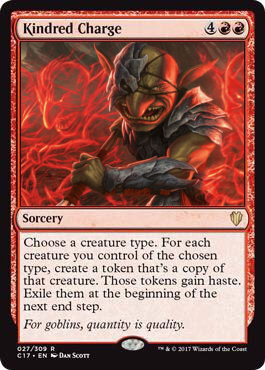 Flavor text: For goblins, quantity is quality. ~ costs 1 less to cast for each 1 life you gained this turn. Pay 5 life: Put three +1/+1 counters on ~. Activate this ability only on your turn and only once each turn. 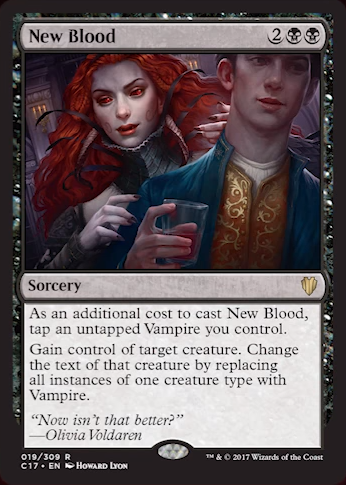 As an additional cost to cast ~, tap an untapped Vampire you control. 7, T, Sacrifice ~: Destroy target permanent. 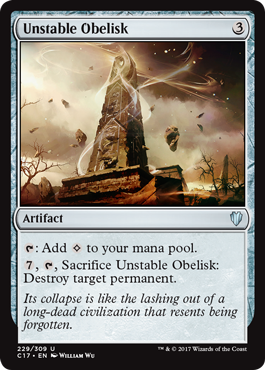 Flavor text: Its collapse is like the lashing out of a long-dead civilization that resents being forgotten.